The wait is over, and WordPress 2.5 is finally released! Compared to the previous 2.3 branch, this new release brings an amazing pack of improvements and additions, and it looks like 2.5 is going to be one of the most interesting WordPress releases of the past years. There is an excellent highlight of all the main features on the WordPress blog: WordPress 2.5 Brecker. – multi-file upload – apparently with a progress bar! There are many more improvements like automatic plugin upgrades and built-in image gallery functionality, which many of you will find useful as well, but I’ve yet to look into them. All in all, I think it’s the most exciting upgrade, WordPress team once again did a great job. Wait no longer: download WordPress 2.5 and get busy with your upgrades! 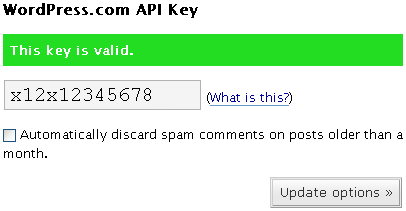 I love the Akismet spam blocking plugin functionality. It makes my life so much easier! However, not many people remember that it has a very useful feature on top of its basic setup: an option to make Akismet automatically discard all the spam older than 2 weeks. Now, instead of carefully clicking through the list of spam, I simply glance through it to mark the non-spam messages off, and then forget about the rest. Akismet takes care of it and makes sure that my spam comments page is never too crowded. After ticking the option on and clicking the button, you’ll have this great feature enabled and your future peace of mind guaranteed. Enjoy! Although I myself have upgraded all my blogs to WordPress 2.2.1 almost a week ago, I still can see it’s never too late to remind everyone to do the same. As you probably now, WordPress 2.2.1 incorporating multiple security fixes and is therefore highly recommended. You can download the full installation of WordPress from official website or, if you’re upgrading from WordPress 2.2, go ahead and use WordPress 2.2.1 instructions and archives by Mark Aquith. According to my blog’s administration dashboard, less that 20 hours ago the long-awaited next version of WordPress engine was released – WordPress 2.2, codenamed Getz. fully integrated widgets Starting with this release, widgets will be a standard part of the WordPress distribution, included in the core source code instead of being a separate plugin. 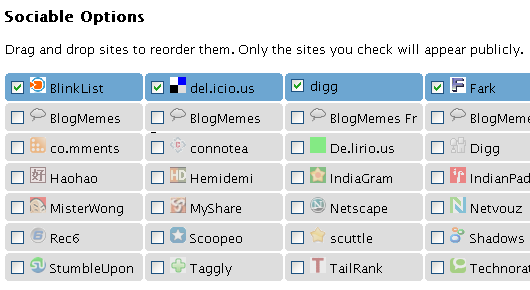 Many recent WordPress themes support widgets already, and it is indeed a very easy way to manage sidebars of your blog. Since I’ve been doing my sidebars manually, it seems to be a perfect opportunity for me to migrate over and document the process in a form of a separate how-to post. Stay tuned! safer activation for plugins: a sandbox approachIf you ever installed more than 10 plugins on a single blog, you’ve probably been there already: you download a plugin, place it in the right directory, click activate in your administration panel, and it breaks your whole blog – nothing works, not even the administration panel itself. The only way out of this is to either remove the plugin files through SSH/FTP or disable its activation in WordPress database manually (phpMyAdmin or something like this). Neither of these methods are simple enough to be used by someone who doesn’t know much about WordPress. This new release introduces a sandbox approach: all plugins are verified against fatal errors upon their activation, and unless they work safely enough (don’t break your whole blog), they are not activated. You get a nice error message explaining the situation should you come across a nasty plugin like this. It took me only a few minutes to set up a fatal error scenario, and I must say: this feature is a great time saver on top of being a great plugin installation safeguard. There’s a many more changes apart from these two, like full Atom 1.0 support – I just don’t use them as much and perhaps need to do a bit of reading/learning myself since too many things have changed in this version. If you want to learn more, it’s best for you to read the great 10 Things You Should Know About WordPress 2.2 post at Technosailor. As always, Aaron Brazell has provided a great review of the most juicy features to be found in this WordPress release. That’s all I wanted to tell for the moment. If you haven’t done so yet, wait no more – just go download WordPress 2.2 and upgrade, it’s definitely worth it! Steve Smith has just announced that the FeedBurner plugin he had developed a few years ago and had been supporting ever since is now officially adopted by FeedBuner, and is supported under a FeedBurner FeedSmith name. If you don’t do this, there will be a conflict of plugins declarations, and you will have to FTP to your hosting and delete the old plugin file form WordPress directory manually in order to fix this conflict. That’s about it! I’ve just updated the plugin on one of my blogs, and will do it on the rest in the next few hours. If you need help with upgrading it, please feel free to ask! What is one of the most important things about blogs? Why, sharing the content, of course! If you’re struggling to find an easy way for your visitors to share your posts with others – look no more. Sociable is a great plugin that will help you give your visitors an option of sharing posts through almost any well-known social bookmarking website (61 website is supported as of Sociable 2.0). Peter Harkins is the developer behind this plugin, although originally Sociable was written by Kirk Montgomery. 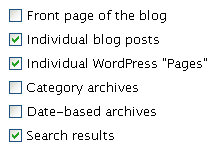 When someone clicks one of these icons, a relevant social bookmarking website opens with a standard page for sharing a link to your post with others. If visitor is not logged in in a particular service, then username and password will be asked first. Login and sharing pages vary in their design and complexity, but Sociable takes care of the most important part of sharing links: it automatically generates URLs understood by social bookmarking websites, so that whenever a sharing page opens, it already has the proper URL of your post. 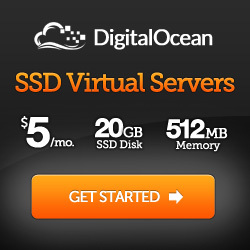 … you’ll be able to select only the websites you would like to be offered. As you can see from this illustration, you can simply tick the websites you like. Also, as the instruction suggests, you can drag-and-drop options to achieve the perfect order of icons to be shown on your Sociable toolbar. 2) Text to introduce the Sociable toolbar. You can type any phrase you like (and yes, there’s a default one too) – whatever you think will motivate most your visitors to bookmark your posts. I think that’s all you need to know about this plugin. It’s definitely one of the must have plugins in my opinion. Give it a try and I’m sure you won’t regret it! Hi everyone, and welcome to our new website! As some of you can guess, it’s a slight modification of a rather popular Nonzero Red theme. Well, it’s not red anymore – that’s one thing for sure. I like this new theme much more than previous template, and its flexible design will make adding new features a lot easier. Please browse around and let me know what you think! If you notice anything strange or wrong, I’ll be sure to fix it as soon as possible. Well, it’s been two days since WordPress 2.1.3 and 2.0.10 security updates were released, and I’ve just upgraded the WP engine behind PerfectBlogger. It is recommended that all users of WordPress 2.x apply the relevant update. For WP 2.1, it’s WordPress 2.1.3 release, for 2.0 it’s 2.0.10. It is important to always make backups. Even if you think you know what you’re doing, backup anyway – just in case. Also, do plan for an immediate verification of the upgrade as it’s better to discover possible errors yourself than wait for your visitors to tell you (that is, if they can tell you given the severity of some upgrade errors – sometimes they can’t open your blog at all, and so won’t be able to submit a feedback form or leave a comment). If you don’t want to download the whole archive with the latest release of WordPress, you can always follow the example of Mark Jaquith. Just use the files and lists he generates for almost every WordPress release to only replace what’s really changed between latest WordPress versions. For this round of upgrades, please read Mark’s post on the WordPress 2.1.3 upgrade.